A slow start to the season is retrievable, as Stoke City have demonstrated by rising to finish ninth for each of he last three seasons; starting a game so sluggishly as to be two goals down in 11 minutes is something else. So from worrying about conceding four goals out of four this season from set pieces, Palace benefited hugely from their own. In Townsend and Jason Puncheon they have two players expert at delivering them, while Christian Benteke goffers added threat on the end of any cross. The trickery of Townsend and Wilf Zaha down the flanks tended to draw free-kicks which Stoke realised too late could be costly. In the ninth minute Townsend swung one to the far post and Walters, challenging the taller Tomkins, appeared to get the final, involuntary touch. 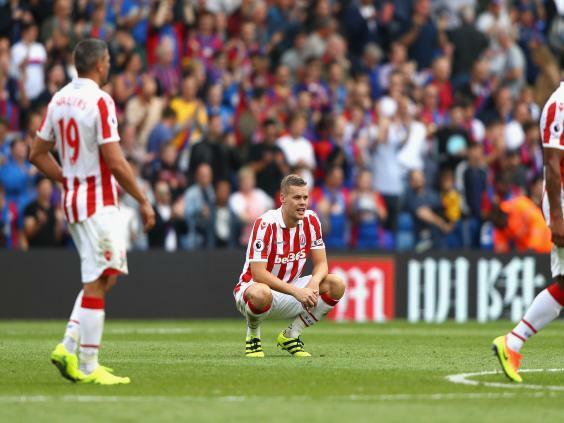 A series of corners were equally threatening and when Puncheon floated one towards the penalty spot, Dann left three Stoke men standing gawping with a perfect run and leap. Until Ryan Shawcross headed a corner at Steve Mandanda just after the interval, all that Mark Hughes’s side had to encourage them was one run by Wilfried Bony, dispossessing a careless Dann and running on but shooting unconvincingly and wide. Hughes must have blistered the dressing-room walls at half-time, although it was Palace who made a change, Tomkins being forced to sit out the second half with an injury. Substitute Damien Delaney was immediately influential at both ends of the pitch. He met another Puncheon corner with a header almost as powerful as Dann’s, which Bojan was well positioned to clear off line and almost immediately he was required to stop Marko Arnautovic on a rare Stoke break. Allowing the visitors a little more possession meant Alan Pardew’s team could counter-attack all the more dangerously, which with the pace of Zaha and Townsend they are exceptionally well equipped to do. It was hardly a surprise that the next goal came from another set-piece. Arnautovic foolishly pushed Townsend into the advertising boards and when the free-kick was not cleared James McArthur collected the ball, benefited from a run outside him by Martin Kelly to make some space and used it to bend a shot that deflected off Geoff Cameron past Given. Palace, with only one point from two previous home games, were now rampant and Townsend ran almost from the halfway line, cut inside with the footwork of a confident performer, and drove low into the far corner of the net. The points secure, Pardew was able to introduce Mathieu Flamini, one of a useful crop of players brought in following American investment to “build a new Crystal Palace” as he puts it “and take the club to the next level”. It was the sort of day they looked to be heading that way, Arnautovic’s goal with the final kick notwithstanding.